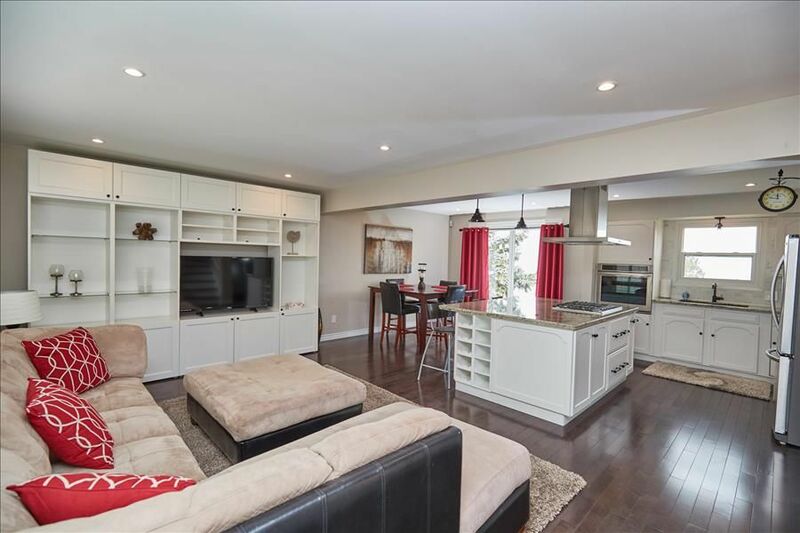 This luxury waterfront home located in the heart of the Niagara Region in St. Catharines is a breathtaking home with expansive views of Lake Ontario. This four bedroom completely renovated waterfront luxury property can comfortably sleep 10 guests with a driveway large enough for 3 cars. Enjoy time gathered around the large center island in the kitchen or in one of two large seating areas. Located on a quiet street with easy access to the Waterfront trail, the St. Catharines section of the Lake Ontario Waterfront trail is approximately nine kilometers and stretches from East Port Weller to West Port Dalhousie. Port Dalhousie one of the regions gems is a short drive from this home and offers the antique carousel, restaurants and world class rowing facility. A short 20 minute drive in either direction will put you in the heart of either wine country or the Niagara Falls tourism area. The Niagara Region is full of world class wineries, take a tour, stop in for a tasting and enjoy the endless rows of vineyards. Niagara Falls offers something for everyone including the Maid of the Mist, Journey Behind the Falls, Clifton Hill just to mention a few. The house was great for our Spring Break getaway. It fit everyone with us and plenty of room for the kids to have their space too. I would have liked the floor vent covers to actually be attached to the floor. I was nervous when the vent covers moved, one of the kids or even us (adults) would have stepped and fell into the hole. All in all, it was a great location for our trip to Niagara Falls! The location is great. Close to everything yet in a very quiet neighborhood. Wonderful sunsets. Plenty of room for our family of 6. But the furniture was not great for hanging around. The kitchen stools are very rickety and the living room tv was not hooked up to cable. Kitchen was very well stocked. We appreciate your groups efforts in being great guests! See you again at one of our Smart Stay Homes. The items you have mentioned have been brought to the attention of the homeowner and we expect repairs soon! Perfect location and ideal property! This property was great for our girls getaway! Plenty of space....kitchen worked really well! Really great view of Lake Ontario....we thoroughly enjoyed our stay after visiting wineries in the Grimsby region! And perfect location between Niagara and Toronto...everything worked great- no issues from start to finish!! This was a wonderful place to stay during our visit to Niagara Falls. It is conveniently located near the Falls, Niagara on the Lake and many wineries in the area. The house was very clean and comfortable, especially the main living area. We enjoyed seeing the views of Lake Ontario, walking along the waterfront, and enjoying the sunsets. There were a few minor repairs that needed attention and were addressed with the management company. We would rent this home again if we visit this area again. A Place to Relax and Bond with the family. The house is very well equipped. Great view of the water, enjoyed the trail, and able to get our feet wet on the lake. A very nice place to stay if you need a break from a Mad, busy, and crazy everyday city world. The home is laid out well for a vacation rental, in a nice neighborhood, and was clean and nicely decorated. The best part of the home is the view of the lake and the walking path access. There is a beach only minutes away (drive) and the drive to Niagara was easy. When we stayed, there was no electricity for the small bathroom by the back door, so while it was not totally useless, was limited to daylight hours only. Also, while we were there 2 of the 3 tvs did not work at all and the 3rd only allowed for a few youtube videos. That was a bit of a bummer. It also took a while to process our deposit refund. I had to call twice to make that happen. They didn't argue that it was owed to us, it just hadn't been processed. Overall, I would recommend this location - maybe just check on the electric and tv situation before booking as they won't give a discount for such things not being available as advertised (the tvs)/expected (electricity in the bathroom).